Deciding what to wear on a daily basis for any woman can be a struggle, but deciding what to wear for an extremely important photo shoot while you’re pregnant and full of crazy hormones can be incredibly stressful and confusing. You obviously want your photos to be beautiful, so it’s only natural that you’ll be stressed out by this decision. Maternity photos can be some of the most beautiful and intimate photos that you’ll ever take and having the perfect outfit is key to making your photos look amazing. No pressure, right? 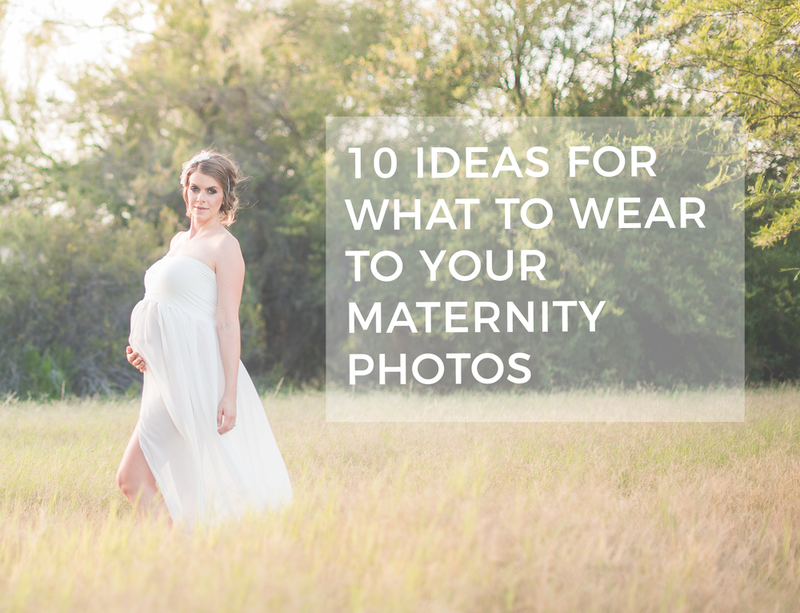 If you’re searching for the perfect outfit to wear for your upcoming maternity photo shoot, here are 10 ideas that will help you and your beautiful belly look stunning. There are a couple of great reasons why a maxi dress is the perfect thing to wear for maternity shoots. For one, it’s incredibly comfortable. Comfort is key when you are pregnant, and when you’re taking maternity photos for an hour or so, you want to be as comfortable as can be. It also looks amazing on any pregnant body because it’s incredibly flattering. It covers up anything you don’t want shown, but can also be pulled agains the belly to show off your adorable baby bump. Long or mid knee length maxi dresses with a chunky necklaces photograph awesome. Many SweetLife Mama-to-Be's have found gorgeous gowns at Sew Trendy as well as some versatile dresses at Old Navy. Since the main focus in your maternity shoot is your bump, don’t let anything take attention away form that, like a pattern or print. Wear solid colors for your bump to stand out the most. If you want to incorporate pattern into your shoot, have your husband wear a patterned shirt instead. If you feel solid colors are too boring, then bring in some fun, bright and bold accessories like necklaces and scarves. 4. Choose your color. Then your outfits. There are lots of great ways to get color palette inspiration. You can search on Pinterest for color palette boards or just photos that contain a color scheme that is appealing to you. I'd also suggest taking a peek at my Maternity Gallery to see what other SweetLife Photography mama-to-be's before you have chosen. Since you’ll have these maternity photos for forever you don’t want to look back on them in 20 years and regret anything you wore. You never want to think to yourself, “What on earth was I thinking?” In order to avoid that, go with a more timeless, simple look. A great option for this would be some jeans, a simple top and a pair of cute boots. There’s nothing wrong with going a little more simple. You can always add a few cute accessories in your jewelry to spice things up a bit. Your photos will look amazing if you wear clothing that has texture to it by adding more dimension to your photos. You can pair a chunky knit sweater with some jeans, wear a lace dress, or an embroidered top. Either way the texture in the clothes will create more interest, therefore making your photos look more beautiful. It’s a great alternative to a print or pattern. A great place to shop for this style is Motherhood Maternity. If you are comfortable with wearing tight clothing and don’t mind showing off all of your gorgeous pregnant body curves, opt for a beautiful tight bodycon dress. They look absolutely stunning on pregnant women because they truly show off the pregnant body. Pregnancy is a beautiful thing and what a woman’s body does when pregnant is incredible. Showing that off is the perfect way to pay tribute to your pregnant self. Be proud of those beautiful curves. Start with your base layer of clothing – your solid colored dress, a solid colored top and jeans and then add layers of texture and accessories. Add a textured short jacket or blazer, add a floral or ruffled scarf, add a chunky necklace and bracelets or a headband. Don’t forget to pay attention to your feet - a cute pair of shoes can make the outfit but it may be appropriate to go barefoot depending on your location. 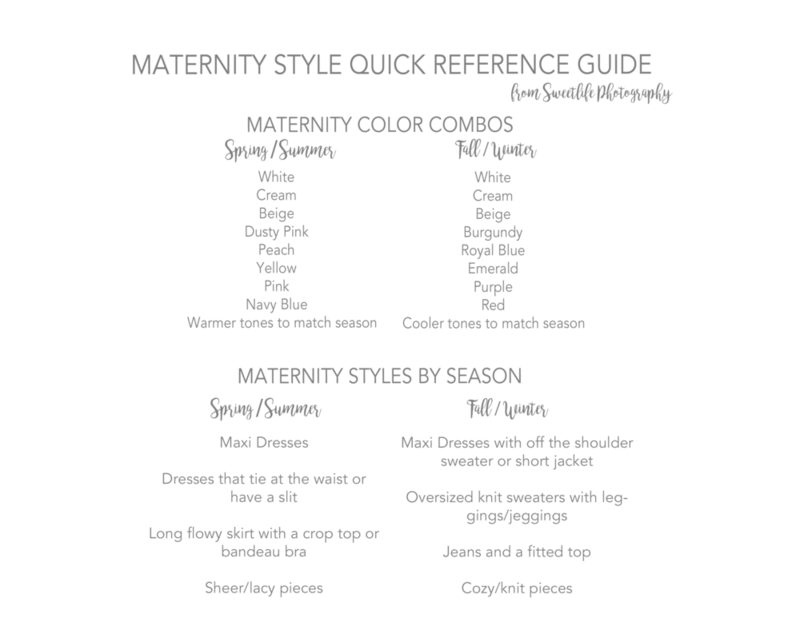 If you're just not sure, another great idea is to have two have two outfits to wear for your maternity photoshoot, perhaps a casual outfit and a dressy outfit. This will not only give you options when choosing which photos you want to hang in your home, but it will also give you some variety in the photos as well. 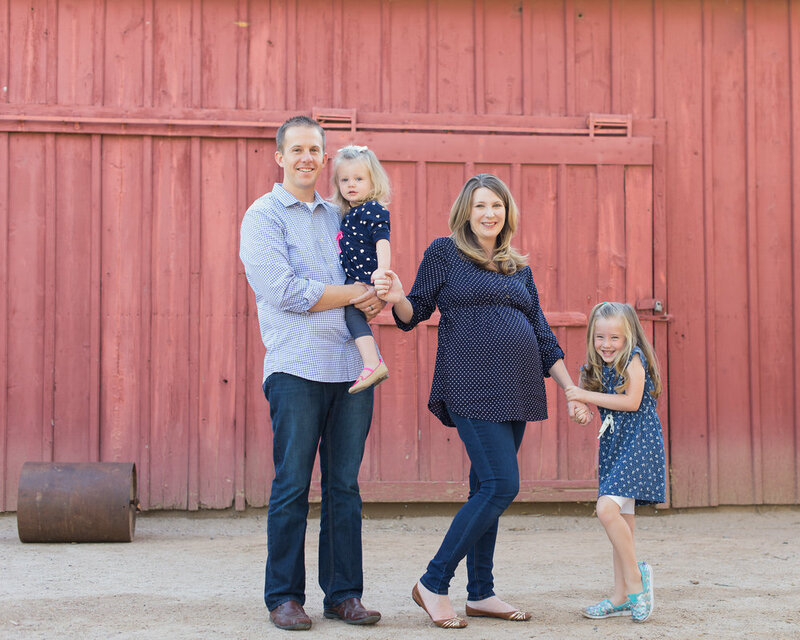 And don't you worry - we will have plenty of time for an outfit change during your maternity session. Want more inspiration... check out my Photo Style + Maternity boards on Pinterest.